What is a personalized Music & Art Portrait? In a musical portrait session, with you present or via a photograph, Will tunes into your unique essence and translates this into music! The piano music he records reflects your qualities and aspirations. Inspired by your spirit, Madeleine simultaneously creates a vibrant full-color, 9" x 12" watercolor painting that is a unique artistic blend of symbolic, evocative images. Her art, like the music, is stimulating and revealing, intuitively created specifically for you. With over 50 years of combined experience in these sessions and hundreds of sastisfied, enthisiastic clients, Will and Madeleine are uniquely suited to creating a valuable and uplifting music/art experience for you. The combination of individually created paintings and music recordings, especially CD's, is powerful, new and unfamiliar, making it perhaps difficult to appreciate their enormous potential. The intention within every Music and Art Portrait is supporting your spiritual unfoldment and healing. A living, enriching affirmation; a treasure that keeps revealing; a one-of-a-kind gift of love and beauty! Your satisfaction is guaranteed. Who Benefits from these Music & Art Portraits? These artistic interpretations are created for for individuals as well as for couples. They also make treasured personal gifts for others. People find them particularly rewarding as gifts for others (or for themselves!) during times of transition, or when healing is needed, or to celebrate a life passge. Such portraits are appropriate for weddings, graduations, births, birthdays, anniversaries and simply to show appreciation. How is a Personalized Music & Art Portrait created? You become the focus of our creative inspiration. We either create the portrait in a live session, with you present, or we work in our studio from a photograph you send us. 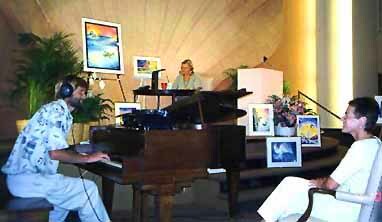 In a live session, you relax and receive a private and powerful 30-minute musical reading, close to the piano, like a musical massage. Madeleine simultaneously creates your 9" x 12" painting, which comes with a compact disc (CD) of your unique music as a special for only $135. This includes a digital master which we keep for you on file. For a portrait from a photograph done here in our studio, the suggested donation is the same, plus $15 for shipping & handling. We can fill orders promptly, and the recording is of highest-quality, with professional equipment and a world-class Yamaha piano. The painting is done with museum-quality watercolor paper and paints.